BUT WHAT WILL HAPPEN TO THE HORSES? Big Turnover in the NYC Carriage Horse trade: There is a turnover of approximately 71 carriage horses in the NYC tradeevery year. 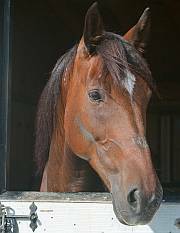 Since 2005, 529 horses have been removed from the Department of Health rolls. Some of them found homes, otherswere rescued but we believe many went on to the auctions where they were made available to kill buyers for purchase. There has beenlittle accountability on the part of the owners. This is a new article on One Green Planet about this issue – with accompanying reports to substantiate these claims. Where do all the NYC Carriage Horses Go? Please read this and the reports below. 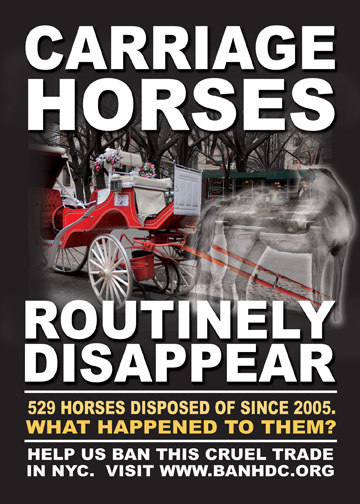 THE 21 PAGE REPORT - NYC Carriage Horses showing horse disposition based on DoH horse lists. NOTE: this information is copyrighted by the Coalition for NYC Animals, Inc. If you would like to use it, we request that you e-mail us at coalition@banhdc.org for permission. The Department of Health - already tried to change the law: The most important flaw in the system is that the law does not require owners to reveal the names of buyers when sold outside NYC as most are. When a change in the law was suggested by the Department of Health, there was pressure and the suggestions were rescinded. Click here for the the DoH’s intention to amend the existing regulations. You will note many other suggestions that were ignored also. Most people who support a ban on horse-drawn carriages are concerned about what will happen to the horses if there is a ban. They think the horses will go to slaughter. While it is fair question to an extent, it is often asked by people who do not have any understanding of how the NYC carriage horse trade operates -- people who try to challenge us as if we had not thought of this important issue. We would not have campaigned for a ban of the NYC carriage trade if we thought all the horses would go to slaughter. This is the proposed legislation, which we drafted, outlining horse disposition when the trade shuts down -- specifically S 17-329 Disposition of licensed horse. (CAPS is new text; strike through is deleted text.) This does not happen now. We also tried to get this bill passed in the City Council as a stand alone (Intro 670 in 2011) but it was killed by Speaker Christine Quinn. Because of the loophole in the law targeting horses sold outside NYC, more than 71 horses do not have their license renewed each year. So any concern about horses going to slaughter if there is a ban should be redirected to the present status quo. What happens to these horses now? 4. Many rescues and individuals have contacted us saying that when the ban happens, they would like to take in some NYC carriage horses. NY Class and the ASPCA also have a list. Because no one knows when a ban will happen, out of respect for their privacy -- and because we do not "telegraph our punches" we will not publish this list.